When extreme events dominate the news, many investors’ first instinct is to panic. The fears of a catastrophic market crash run deep. While there are often short-term consequences to these volatile events, reducing stock exposure has proven to be a costly mistake for long-term investors. In fact, rebalancing portfolios, harvesting losses in taxable accounts and making other moves during a market crisis can deliver tangible and significant long-term benefits. 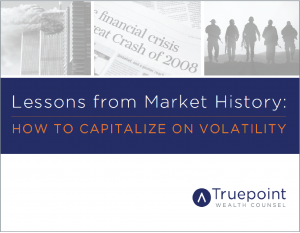 Download our new eBook, Lessons from Market History: How to Capitalize on Volatility, to learn more about how history shows the value of staying the course in the face of crisis.